win them the favor of Jesus Christ! Amen. Today is the feast of the Immaculate Conception and I wish to share with you a little sliver of heaven. Yesterday was my birthday and my entire day, I thank Mama Mary and the Holy Trinity for blessing me with the honor of spending that day with them in the following way. I attended the 8 AM mass as I usualy do and left in peace to share this inner peace with every soul I was to come in contact with. I got home and prayed to our Lord asking Him about how I was going to spend the day. I went into my yard and began to water my plants. I am in San Diego and the weather here permits me to do so. As I was watering my plants, I moved to my rose bushes and began to water them. I only have three and my gardening skills have taken a back seat for the past few months so I had not been attending to them or most of my yard for that matter. I noticed my roses in bloom but one bush stood out over the others. One rose, one perficet rose was fully open. This plant I call my “Sacred Heart” roses. They are white roses with the outer petals sprayed with red. I often ponder it as the prestine white rose being dipped into the blood of our crusified Lord. 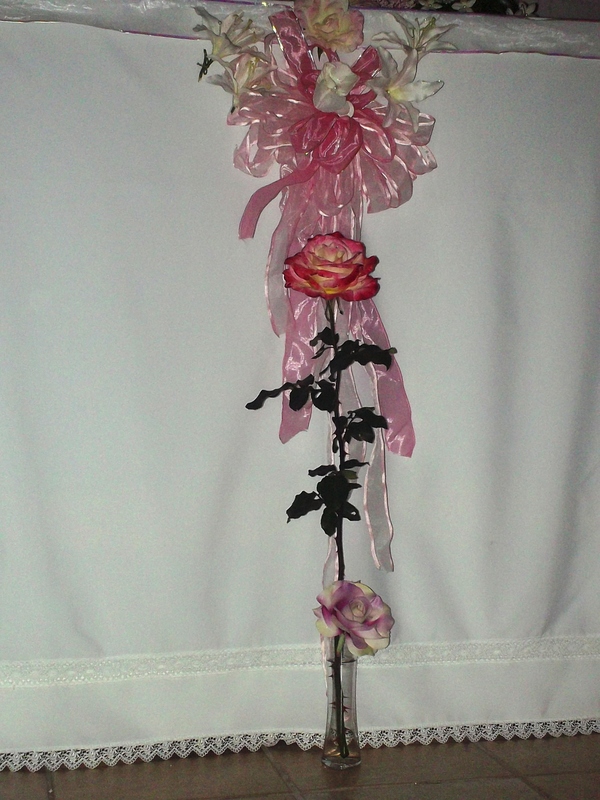 The rose that stood out had a very long stem. I had never seen a stem this long from one of my plants. Not only was the stem very long, no other branch came forth from it. It was attached directly to the base of the bush and very close to the ground where the root entered the earth. Mind you, the stem on this beautiful flower looked as if it was three foot high. If I were to have cut it further it could have been. Three being the Holy Trinity did cross my mind. I did not grow this rose. This was a gift from Abba Father telling me to bring it to Mama Mary. I cut the rose and knew exactly where it needed to go. I dropped everything and headed back to church because I knew this special rose belonged to Mama Mary as her Immaculate Conception was the true celebration I was looking forward to. As I pulled up, I noticed our maintenance man working outside and asked him to let me in, so I could present it to our Holy Mother’s statue. I walked in and the woman who decorates the church was just starting to decorate for the following days feast. She needed help and I told her I would help her. I spent the remainder of the day helping her to decorate for the feast. I had to run back home at a point because we did not have a cloth big enough to cover the table our Holy Mother’s statue would be on. I brought back the same cloth, that was used when the international pilgrim traveling statue of Our Lady of Fatima made a visit to our parish. 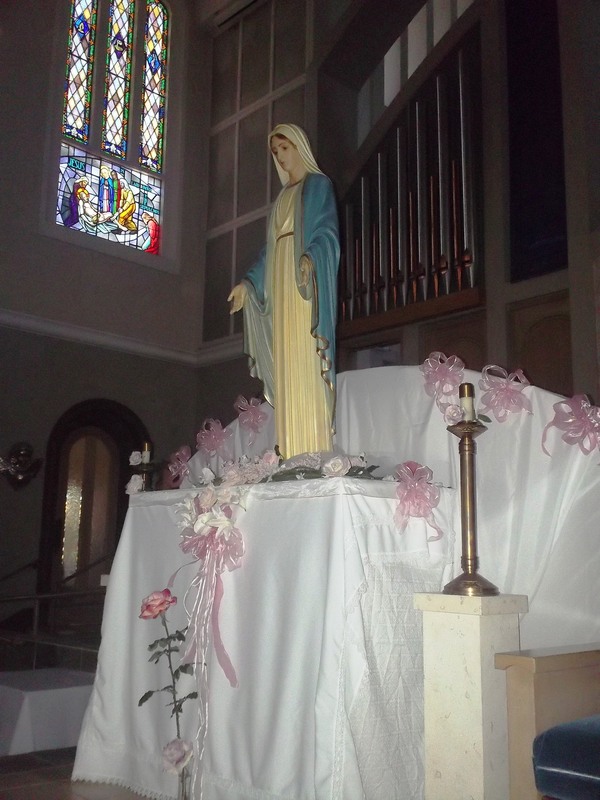 This beautiful rose became the center point under the Immaculate Mary’s statue. The patroness of the Legion of Mary in which I serve in, is called “Mystical Rose”. There is no doubt, our Lord wanted me to spend this birthday doing exactly what I had done and provided me with a beautiful gift to give Mama Mary on the day of her Immaculate Conception, the day of her birth into life. This time when Our Lady appeared again in the parish church there were only three persons present. Among them was the Reverend Confessor of the seer. Our Lady, as “Rosa Mystica,” wore a white cloak. This was held at the right side by a boy, at the left side by a girl. Both were also dressed in white. 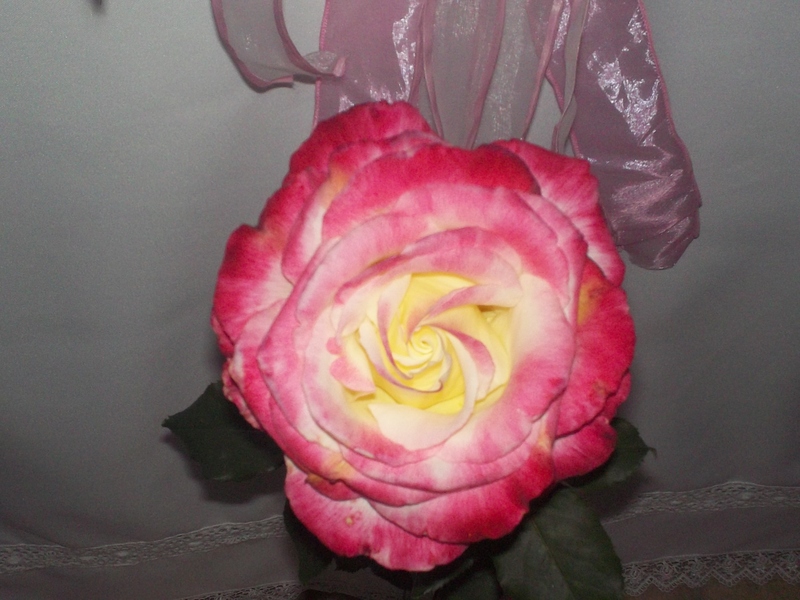 EDIT TO ADD: I just noticed from another photo, the rose is red, white and yellow. Maybe I should call it the Mystical Rose. From another site: “By praying, sacrificing and doing penance we bring roses to our Mother and do reparation for the injury of the swords. A white rose : spirit of prayer.